Waitrose beef is sourced from a carefully chosen group of British farmers. We have worked exclusively with many of our farmers for more than 10 years, so they understand and share our values and are committed to our high standards of quality, food safety and animal welfare. This long-term partnership offers our farmers the security they need to invest in sustainable farming practices that help to benefit the environment and encourage local wildlife. Specialist butchers prepare the beef before it goes on sale, so it's in the hands of experts from farm to counter. Prime cuts are matured for extra tenderness and flavour and every piece of beef we sell can be traced back to the group of farms where it was reared. Solely sourced from approved farms, our British beef is sold prepacked. Our essential Waitrose British beef comes from prime cattle, from both native and continental breeds, that are fed a healthy grass and cereal-based diet. The beef is expertly butchered to give you the best cuts. All our Organic beef comes only from Waitrose approved farms, which as well as working to our usual standards, follow regulations laid down in the Compendium of United Kingdom Organic Standards. Cattle come from farms in England, Scotland and Wales, graze on organic pastures and are reared on an organic forage based diet. Our beef supply is integrated with our dairy supplier to offer an outlet to farmers for male dairy calves, whereby organic calves are reared organically for beef supply to Waitrose. Prime cuts (from the hindquarter) are matured on the bone for 7 days to enhance flavour and tenderness. 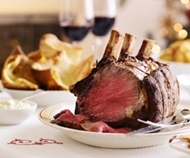 Duchy from Waitrose Organic beef is available from the prepacked meat fixture. Waitrose Aberdeen Angus beef is produced from cattle sired by registered pedigree Aberdeen Angus bulls. The Aberdeen Angus is a native British breed, whose meat is naturally marbled with fat, making it exceptionally tender and full of flavour. We hang the hindquarters on the bone to mature it, so it becomes even more flavoursome and tender. We also sell dry-aged Aberdeen Angus beef, which is matured on the bone for at least 21 days, for a rich, almost buttery flavour. Both varieties are sold from the service counter, and Aberdeen Angus mince and burgers are available from both our prepacked assortment and service counter. The Hereford is a native breed dating back to the 1700s, and Hereford beef is produced for us by a small group of dedicated farmers. Our Hereford beef is produced from cattle sired by registered pedigree Hereford bulls. Living outside for most of the year, the cattle grow slowly, producing tender meat, marbled with fat that creates a distinctive flavour. Hereford beef is sold pre-packed. By maturing our Aberdeen Angus beef through the dry-ageing method, we are able to offer beef that is consistently tender and rich in flavour. Only the finest cuts - from the loin and rump - are matured through the dry-ageing process, ensuring that we can provide the very best beef to our customers. For a number of years Waitrose has been pioneering a new and different way of working with our suppliers. We have been working closely with a select group of farmers to ensure that all our beef is of the best quality and is produced to the highest standards of welfare and animal husbandry. We have established a number of farm assured production schemes, including one for beef. We have created a dedicated supply chain where the meat goes directly from known farms to specially approved abattoirs. All Waitrose beef comes from animals born, reared and slaughtered in the UK. All processing of meat takes place in the UK. Slaughterhouse licence number (SL): identifies where the animal was slaughtered. Cutting plant licence number (CUT): indicates where the meat was cut and prepared. 'Origin UK' confirms that the animal was born, reared and slaughtered in the UK. The date code identifies that group of animals. At our Meat Service Counters, tickets and signs confirm that the beef is of UK origin. The coding information which provides full traceability is recorded at the counter, and is available with a full explanation on request. All our minced beef is of UK origin. Although the slaughterhouse and cutting plant licence numbers are not required for mince, we still maintain full traceability. The traceability of those products in which beef is used as an ingredient (for example, beef burgers) is achieved simply by using the date code and other codes. Please feel free to ask our Meat Service Counter assistants if you'd like to find out more. How do you look after animal welfare? All our beef is reared to standards set independently by Assured British Meat (ABM). These cover everything from ensuring that the animals are fed a healthy diet, to minimising stress during transportation. Farms are inspected regularly to make sure that these standards are met fully. The cattle are only transported by ABM-approved hauliers, and on arrival at the processing plant, are rested and given fresh water to drink. What about the beef in Waitrose burgers, meatballs and ready meals? All the beef we use in ready meals is British, and for some dishes, we use only Aberdeen Angus beef - look for the logo on the pack. We offer a range of burgers and meatballs that are made from British, Organic and Aberdeen Angus beef. The range varies from Aberdeen Angus Quarter Pounders that are seasoned with salt and pepper to British flavoured burgers, such as those with parmesan and rosemary. A small selection of them are gluten free, please check the ingredient panel for confirmation. Waitrose works with dedicated British and New Zealand farmers to provide tender, naturally reared lamb, all year round.